Skiffle was a phenomenon; Lonnie Donegan was a phenomenon. Many thought the two were the same thing, until rock 'n' roll killed off skiffle - and Lonnie became a fixture in the British music scene. Here is the complete story of Lonnie on Decca and Pye, from 1954 to 1966. Demos from Lonnie's personal collection and radio broadcasts round out the 209 songs on this set. These were the records that changed the face of music in England. From the groundbreaking Rock Island Line to the bandwagon-jumping World Cup Willie, all Donegan's hits and misses for Decca and Pye are here, together with rare and previously unissued tracks! Donegan may have been skiffle's great star but he graduated to make some fine pop and country recordings, all of which are included here. The box also contains a detailed discography, biography, dozens of fine pictures and memorabilia and an indepth interview with the man himself. 16 Which Way Did He Go? As he had produced many Calypso records (and was married to a West Indian), it was almost certainly Denis Preston who had proposed that Duncan record the Calypso song "Last Train to San Fernando". Adapted by Jack Fallon and Denny Wright—whose breath-taking Latin-American style guitar solo was a highlight of the record—"Last Train" entered the charts at the end of July, 1957, and stayed there for seventeen weeks, kept off the Number One spot by Paul Anka's "Diana." 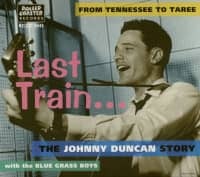 Johnny Duncan became an overnight star and was quickly offered a regular spot on Radio Luxembourg, and later a six-week DJ stint on BBC Radio playing country records on a programme called "Tennessee Song Bag." "Last Train to San Fernando" had begun its life as a Road March contender in 1949 or 50 for Mighty Dictator (Kenny St. Bernard). On its surface, the song's chorus seems to convey the urgency of catching the evening's final train home from Trinidad's capital, Port of Spain, to its second city, San Fernando, before service shuts down for the night. (No doubt many who heard Duncan's version figured San Fernando for some backroad town in southwest Texas rather than southwestern Trinidad.) One doesn't have to dig deep, however, to hear a classic Trini double-entendre—about "Dorothy" offering the singer a last chance at a fling ("If you miss this one/You'll never get another one") before her impending marriage ("Be careful of the place you are taking me/Because if you slip, I'll slide/And I'll never get to be a bride")—but Duncan's bouncy delivery obscures the racy subtext. Indeed, Preston arguably bears much of the responsibility for calypso’s postwar popularity in Britain. According to Richard Noblett, Preston, who also oversaw the production of dozens of influential jazz discs for Pye and Columbia in the U.K., had put Freddy Grant’s West Indian Calypsonians on the bill of a jazz concert he’d presented in London in 1945. Three years later, serving as Decca’s representative in New York, he discovered the Harlem calypso scene and went home to England determined to promote the music there. 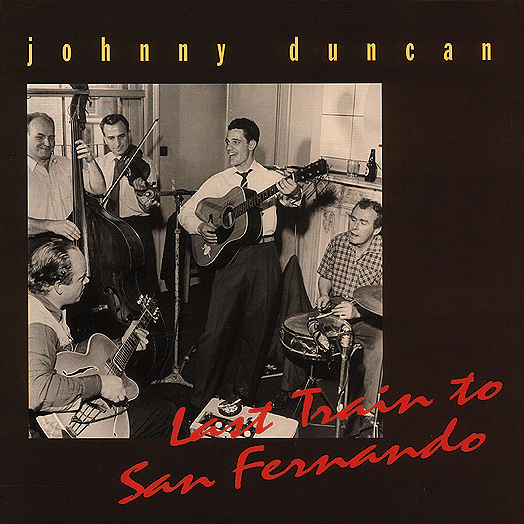 Transplanted American Johnny Duncan was a brief sensation in England with his version of a calypso song, Last Train To San Fernando – a No.2 hit in 1957. Subsequent singles and album tracks such as this made it clear that Duncan's heart lay in country music. He was a miner's son, born in Oliver Springs, Tennessee on September 7th 1932, and headed for Texas in his mid-teens where he learned guitar and performed with a hillbilly trio. Then came the draft. He arrived as a serviceman in England in 1952. A year later he married a Cambridgeshire girl, Betty. After a brief return to the US, her illness and homesickness brought them back, and he briefly worked on her father's market clothes stall. It was while performing at the American Club in Bushey Park that Duncan attracted the attention of Dickie Bishop, banjoist with Chris Barber's jazz band. Bishop invited Duncan to meet Barber - and Duncan was hired at £10 a week. He stayed with the Barber for a year, performing, recording, and broadcasting. After Last Train To San Fernando had become an all-too-distant memory, he returned to the US before settling in Sunderland, North England. He toured Australia in 1972, and subsequently emigrated to New South Wales. He died on July 15, 2000. 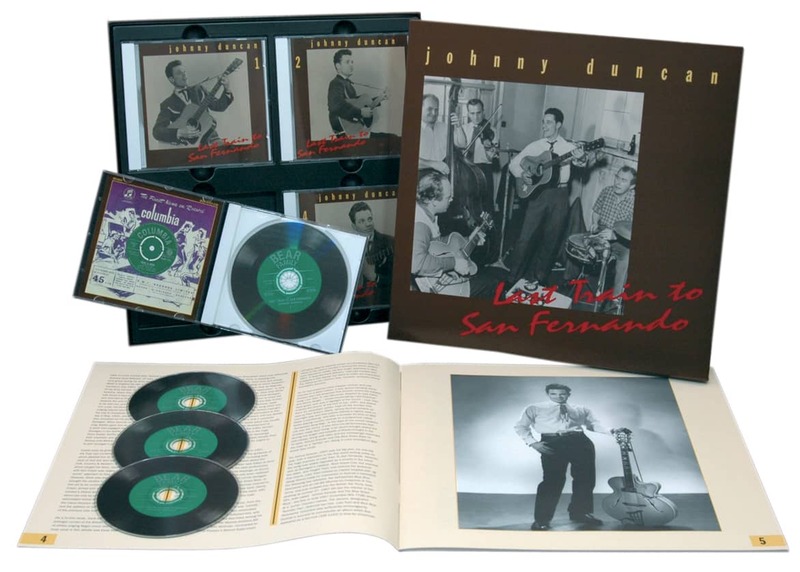 Customer evaluation for "Last Train To San Fernando (4-CD Deluxe Box Set)"
Skiffle Music An emotive word for anyone living in Britain in the ‘50s for it brings with it images of home-made instruments, church halls and home-grown heroes like Lonnie Donegan, Ken Colyer, The Vipers, Chas McDevitt, Johnny Duncan and many others. Ken Colyer pioneered the term in England by describing a small ensemble within his jazz band as a 'Skiffle Group', but it was Donegan's Rock Island Line, a surprise hit in 1955 that really started it all. http://theaudiophileman.com/skiffle/ An emotive word for anyone living in Britain in the ‘50s for it brings with it images of home-made instruments, church halls and home-grown heroes like Lonnie Donegan, Ken Colyer, The Vipers, Chas McDevitt, Johnny Duncan and many others. Ken Colyer pioneered the term in England by describing a small ensemble within his jazz band as a 'Skiffle Group', but it was Donegan's Rock Island Line, a surprise hit in 1955 that really started it all.